Revisit the story of Half-Life from yet another perspective. This feature was originally published in PC Gamer magazine back in October. If you enjoy this feature, you can subscribe across print and digital. Has any videogame story been told from more perspectives than Half-Life’s Black Mesa incident? 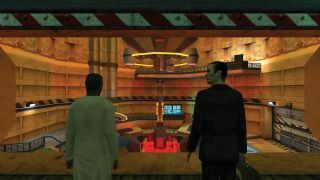 Including expansions, the vanilla game offers three points of view alone, while countless mods have added to the Black Mesa lore, introducing new playable stories centring on lawyers, black ops assassins and even alien slaves. Half-Life: Echoes is the latest in this tradition of framing the Black Mesa disaster from a new angle, and it’s easily the best singleplayer mod for Half-Life in years, offering incredible level design, thrilling survival horror and blistering action. It also weaves itself into the broader Half-Life fiction in some clever ways. Created by first-time modder James Cockburn, Half-Life: Echoes puts players in the shoes of Candidate Twelve, another Black Mesa employee who arrives for a normal day at work when the resonance cascade transforms the facility into the world’s most technologically advanced abattoir. Like Freeman, Shepard and the rest, you must navigate and survive Black Mesa’s labyrinth, battering zombies and blasting marines while the G-Man observes it all. What make Half-Life: Echoes stand out from other Black Mesa retellings is the sheer level of craft and ambition that has gone into it. To begin with, the mod’s 20-odd maps are enormous and stunningly detailed. Even the very first area you spawn in, an underground car park, impresses with its cavernous scale and moody lighting. As with the original Half-Life, Echoes commences with a peaceful tour of its own segment of the Black Mesa facility, though smartly it lets you explore on foot rather than confining you inside a train. When the cascade occurs, it does so at a distance, unfolding as a gradual infrastructural collapse rather than an instant demolition. Lights flicker and tremors shudder through the earth, while the scientists and security guards speculate on what’s going on. One of my favourite aspects of the mod is how smoothly it repurposes dialogue from the old games to assemble its own conversations and narratives. Even when the seams are visible, it’s beautifully done. Broadly, Echoes mimics the arc of Half-Life, but distils its key elements into more potent forms. The arrival of the marines, which in the original game is barely touched upon, is here given the kind of treatment you’d expect from a Call of Duty game, featuring a jet flyover and an almost parade-like column of solders, tanks, and twin-rotor helicopters. The first half of Echoes is almost pure survival horror, limiting your arsenal to just a few weapons and making clever use of scripted scenarios to surprise the player. In a splendid Alien-esque sequence, a strange sluglike monster hunts you through a tight cluster of corridors and vents as you desperately try to find a way out. Meanwhile, your personal resonance cascade comes in the form of a gargantuan monster, which traps you inside a train carriage alongside a bunch of other scientists before destroying everything in sight. That same monster hunts you throughout the mod’s running time, appearing at various points just to make your day that little bit more terrifying. Once Echoes starts doling out the heavier weapons, the mod ups the ante rapidly. Perhaps a little too rapidly, as the difficulty spikes with the intensity, resulting in several transitional combat encounters that are much tougher than anything either before or afterward. Fortunately, the last hour of Echoes moderates its tsunami of opponents with plentiful weapons and ammunition. The climactic battle happens on a scale that outclasses Half-Life’s infamous Surface Tension chapter, a fight that repeatedly escalates like a microcosm of the mod as a whole. Two decades on, Half-Life’s combat holds up, and Echoes makes fantastic use of its weapons and enemies. As the work of a single person, Echoes is a remarkable feat of design, while its detailed environment design and sharp pacing more than make up for the outdated visuals. That said, there are a few minor flaws. Although Echoes is vast in scope, in running time it is short, easily completable in a couple of hours. It also concludes in an abrupt sequence which, while an interesting addition to the overall Half-Life plot, feels artificially bolted onto the tail of the game. Lastly, and this isn’t really a flaw, but anyone coming to the mod hoping to see new features, such as weapons or enemies, will come away disappointed. Ultimately, these are tiny issues in what is essentially a fourth Half-Life expansion, playable for free. Echoes is that well made.